The Cards for Soldiers group included "I Love You" cards as part of our challenge this month. So here are just a few of my creations that will be donated. I used a rolling marble technique (yes, I promise a tutorial very, very soon) to create the accents paper that I did using Chocolate Chip and Pixie Pink classic inks on white glossy paper. 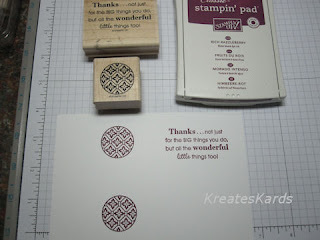 Solid paper is Stampin' Up! Pixie Pink. I sponged the edges with Chocolate Chip classic ink and then hand wrote the I Love You! 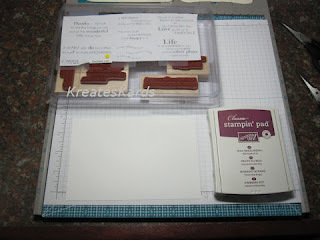 using a Chocolate Chip Stampin' Write marker. Don't you just love the marble effect on the glossy paper. It is so easy to do and can be used for so many things: accent paper, butterflies, flowers to just name a few. 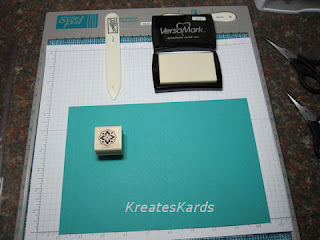 I took the marble paper and punch it out using the Stampin' Up! 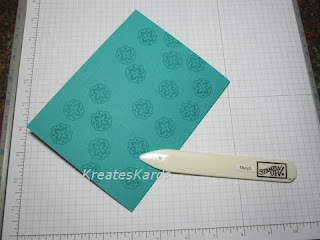 Scallop Paper Punch, then cut them like I did in the sunflower tutorial. Gives the flowers shape and dimension. 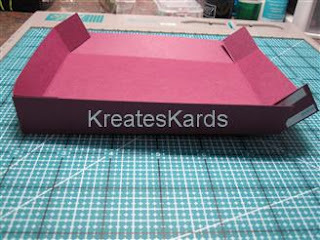 Once you have completed your box, it is a perfect fit for 4 1/4" x 5 1/2" cards and A2 envelopes. You can easily put 5 or 6 sets in here. Wouldn't it make a great gift. This idea was inspired by a tutorial on the Scor-Pal.com website. NOTE: I have one pair of scissors for paper and one just for ribbons. These are absolutely the BEST scissors I have ever use. Highly Recommend. 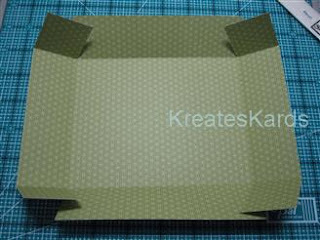 Here are our two sheets of cardstock for the box. I chose to do them in different papers so that is very obvious whether I am working on the top (Rich Razzleberry) or the bottom of the box (Cottage Wall DSP). 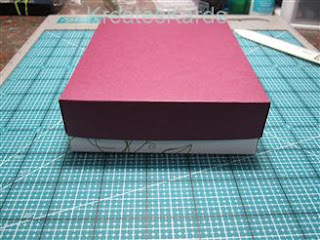 You can do your box in any color or any color combination. Starting with the Rich Razzleberry for the lid, score all 4 sides at 1 inch. This is the paper flipped to show you the crease lines. Score all 4 sides of the Cottage Wall DSP at 1 1/2" on all 4 sides. If you look closely you can see the score lines on the 4 sides. Using the bone folder, crease all 4 score lines on the Rich Razzleberry. Cut here on all 4 sides. See photo below for full view. Do not cut passed the crease. These will be on the inside of the box. Put small pieces of double sided tape (you need something strong, SNAIL adhesive will not hold it long term because these are stress points). Do not remove the protective film on the double sided tape until you are ready to do that corner. Corner on bottom left has been completed. See photo below to see how you line the sides up. Remove tape protective film only on the corner you are working on. This way you have more control and less chance of it adhering to other things while you are working on the box construction. This is the bottom right corner of the lid. 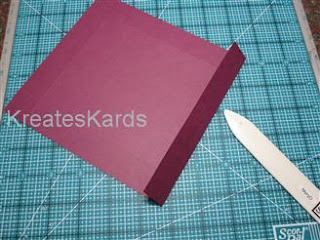 I am aligning the cut tab with the crease line on the side. The protective film has been removed from the double sided tape (see the shiny pieces on the tab.) Once tab is straight, push up the side piece up to it and secure. Be sure to line up the corner edge. 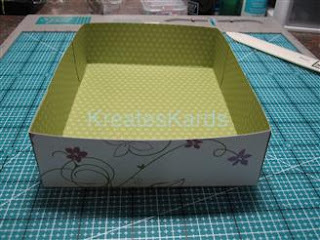 Here's all 4 corners of the lid completed. Using the bone folder, crease all of the score lines on the Cottage Wall DSP. This is the bottom of the box. DSP (Designer Series Paper) is doubled sided paper. Cut 4 tabs just as you did with the lid. Attach pieces of double sided tape to the tabs. Do not remove the protective film. Put the bottom of the box together just like you did the lid. Here is a photo of the finished bottom. Put lid on the box bottom. I love this color combination. 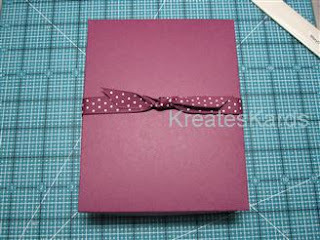 Wrap your Rich Razzleberry Polka-Dot ribbon around the box and tie a bow. 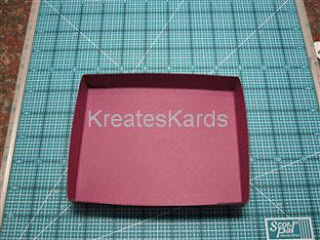 Don't make the ribbon too tight, you want to be able to slide it on and off to get your cards out of the box. If you want the box more plain, leave just like this. OR you can decorate your box lid any way you want. I cut out 5 butterflies and glued them to the lid. Then using a black Stampin' Write Marker, I drew in the bodies, heads, and antennas. I'm not an artist but thought they looked cute. If you want to give cards as a gift, this is a great gift box. You can design your cards to match it making it into a set. Lovely As a Tree Stamp Set (item #115026) has to be one of my favorite sets. It is one that I had wanted for a very long time but hadn't purchased. 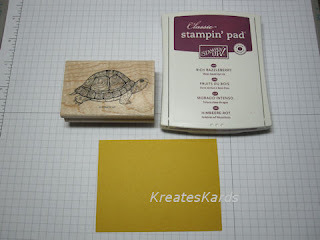 It arrived the other day as a gift from Stampin' Up!. I've had such a good time making cards with it, that I felt I should showcase it on my blog. I think you will like it too. 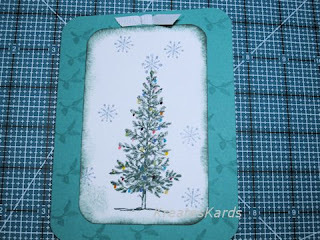 This cards was stamped on Whisper White cardstock using Handsome Hunter classic ink. 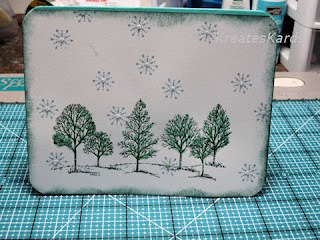 I stamped the snowflakes using Bordering Blue classic ink. I used a sponge with Handsome Hunter to do the edges of the card front. 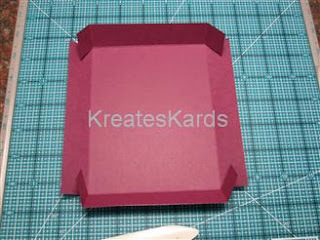 I attached the card front to a card base of Bermuda Bay cardstock. I added in a bit of glitter glue on the trees and snowflakes. This card is one of my favorites. I used a card base of Bermuda Bay, then attached 2 squares of Crushed Curry. The tree was stamped on Whisper White. I used Chocolate Chip classic ink to stamp the tree outline. 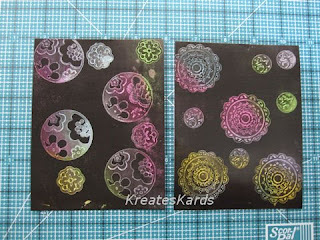 Then I took the pastel chalks (Stampin' Up!) and added the leaf colors (shades of yellow, green, orange, brown). 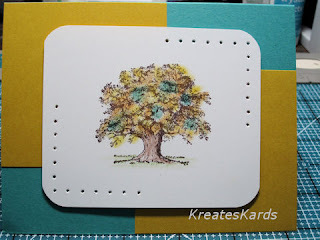 The trunk of the tree was filled in with the Stampin' Up! brown watercolor pencil) as was the grass but I used them as pencils, not as watercolor pencils (no water or blender pen used). 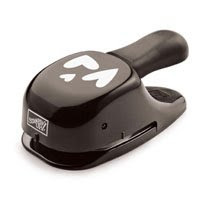 One of our newest tools is the paper punch. I use it to accent two of the corners. Using dimenisonals I attached the image to my card base. 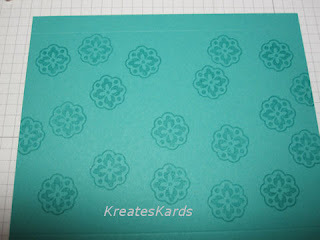 I think Bermuda Bay cardstock is going to be one of my favorites this year. 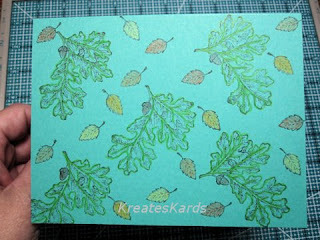 Using Handsome Hunter classic ink I stamped all the leaves then filled them in with my watercolor pencils (but no water or blender pens used) using them as pencils. 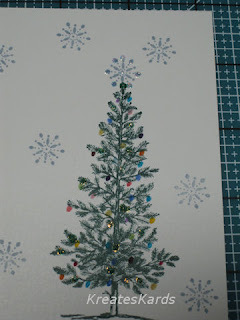 This was accented with Stampin' Write pens to give the feel of ornaments along with a bit of glitter glue (Skittles). I used a sponge with Handsome Hunter to accent the edges of the white cardstock and also used a corner rounder on it and the card base. Added a Whisper White bow to the top. 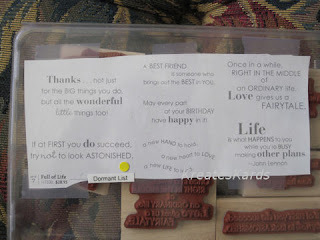 I had the good fortune of receiving "Lovely As A Tree" stamp set from Stampin' Up! as a gift yesterday. It is a stamp set I have wanted for over a year and had not yet ordered. It is fabulous. I got the chance to use it tonight and wanted to share the results with all of you. Snowflakes were stamped with Bordering Blue Classic Ink. Trees were stamped with Handsome Hunter Classic Ink. 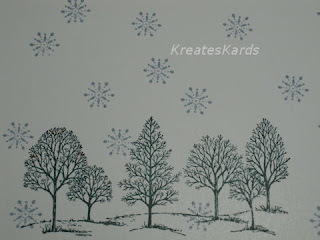 I used tiny snowflakes from Snow Swirled (item #111690). Can't you see this on the front of a Christmas card. I decided to decorate this image a bit. I also use the tiny snowflake in this image (same as the one above). I used my Stampin' Write Markers to add little dots of color (ornaments) and also Diamond Stickles to add a bit of sparkle. So this is my contribution to Christmas in July. Just a bit to add some holiday spirit. Cards for Soldiers - Won't you help? When you sign up you will sign up for how many you want to do 15,30,45,100. You will also tell us what time zone you are in. The time zone will tell us to whom you will ship your cards to at the end of the challenge. That shipper will then compile all the cards and send them to units on the ground in Iraq and Afghanistan & Navy ships. Each time zone is assigned 2 or more units to ship to (a unit is 120-160 soldiers/sailors). " When your heart is full, you often want to show it. 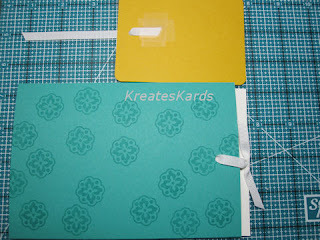 Punches are a quick and easy way to add interest, dimension, and color to your cards, tags, and scrapbook pages. 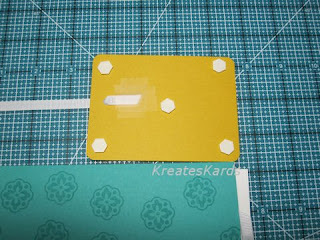 You can glue punched shapes directly onto your projects or layer a sheet of card stock that has been punched over a coordinating card stock for a reverse effect. The Full Heart punch is a classic heart shape that coordinates with the Love You Much stamp set. 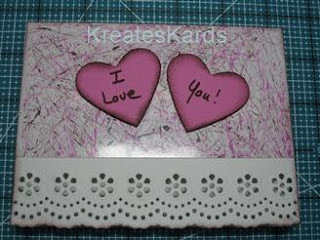 Love You Much Stamp set is on Pg 44 of the catalog and is item #113756. 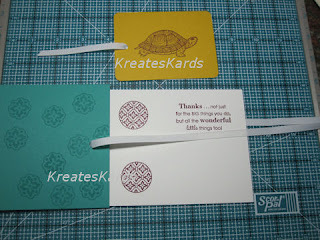 Order on-line thru my Stampin' Up! website or by contacting me directly. 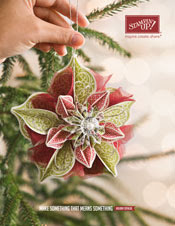 Tonight while going thru some tutorials on Splitcoaststampers.com, I came across one called Joseph's Coat. It intriqued me, so I had to try it. Use a high gloss paper ... regular paper will warp. Images with more filled in areas will show more color thru the black. You don't need the rainbow ink pads. I used paper towels and randomly colored in. 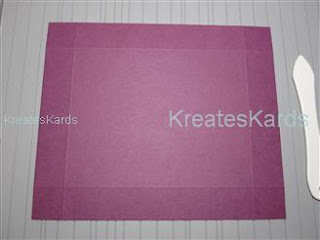 Be sure you tap firmly to get the embossing powder excess off the card. DO NOT use a paper towel at the end as suggested in the tutorial. 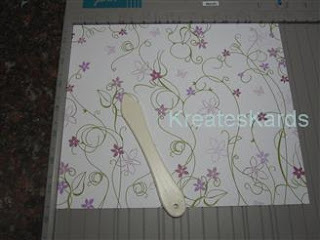 It will put scratch marks across the paper and designs. Instead use the brayer without reinking to smooth it all out and expose more of the colors. I'm going to use the above pieces as accent pieces on a card I think. This card is amazing. 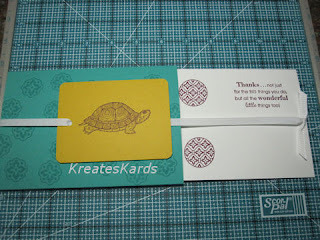 It is an optical illusion that the ribbon is wrapped around from the left of the card (Bermuda Bay Cardstock) and around the Whisper White Insert. It may seem a bit complicated when you first start to create your card. 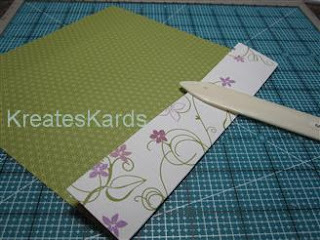 However, once you make the card it will be very easy the 2nd time to make again. Photo 1 ... Bermuda Bay Paper 9 1/2" x 6 1/2"
Score at 1/2" and 5"
Photo 2 ... 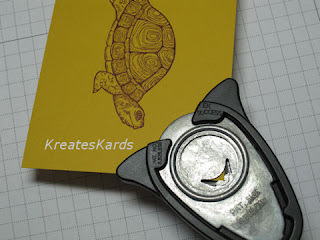 Using the Versamark Ink Pad and stamp of your choice from teh Circle Circus stamp set; stamp random images on the Bermuda Bay cardstock between the two score lines. There is no need to stamp the whole page (unless you want to). Photo 3 ... This is how the paper will look after you have stamped it. The Versamark Ink is clear but darkends the stamped image on your paper. Versamark is often used as a watermark ink. Photo 4 ... Curshed Curry Paper is 4" x 3". 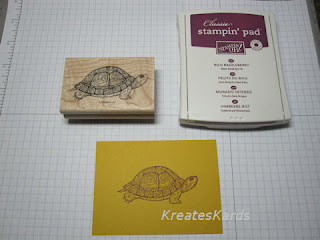 Using Rich Razzleberry Classic Stamp Pad ink, stamp the turtle (or other image) from the Nature's Nest stamp set. Photo 5 ... Here's a look at your finished image on the Crushed Curry cardstock. Photo 6 ... 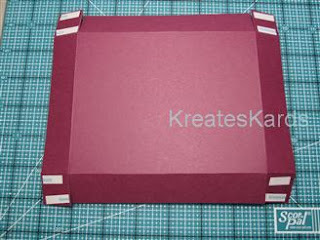 Using the 3/16" Corner Rounder Paper Punch, round each of the 4 corners of the Crushed Curry cardstock. Photo 7 ... Photo of the finished look of the turtle piece. Photo 8 ... Whisper White Cardstock is 6 1/4" x 4 1/4". 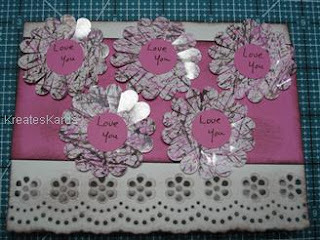 Using Rich Razzleberry Classic Stamp Pad Ink, stamp a sentiment from the Full of Life Stamp Set. 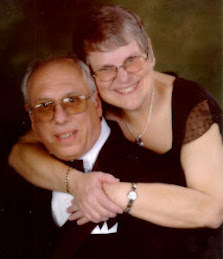 See next photo for placement of sentiment. Photo 9 ... When you stamp on the Whisper White Cardstock, remember that there will be a ribbon running down the middle from left to right. I placed the greeting in the upper right corner, then added in two images from the Circle Circus set. The remaining white area in the lower right corner will give you space to sign the card and/or leave a small note. Photo 10 ... 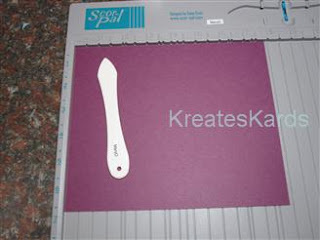 Using your Bone Folder, crisply crease the fold lines on the Bermuda Bay Cardstock. 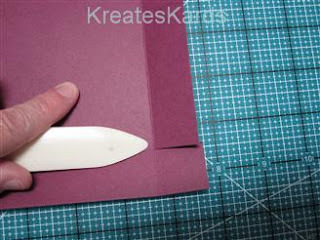 You "may need to" trim the back piece just a tiny, tiny bit to prevent the card from bowing. 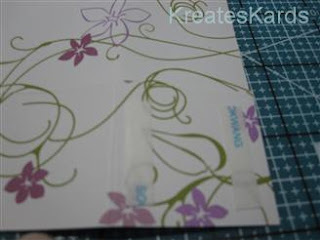 Using Sticky Strip, fold over and adhere the pieces together. 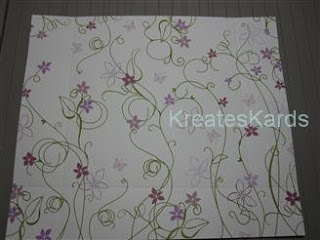 Photo 11 ... Center the Whisper White Cardstock on top of the Bermuda Bay piece. 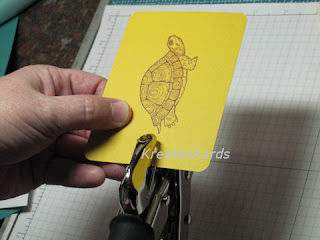 Using the largest hole punch on your Crop-A-Dile punch a hole about 3/4" in and all the way thru all 3 pieces of cardstock (insert, front of card, back of card). NOTE: If you are holding the two pieces(card & white insert) side by side in front of you, the hole on the card would be on the right side and the hole on the insert would be on the left. By punching them together you guarantee perfect alignment for threading your ribbon thru. EXTRA NOTE: At our workshop yesterday (thanks to JoanL) we discovered that if you lay your bermuda bay card sleeve and your whisper white insert side by side (just like when the card will open) then close them like a book then punch ...it was far less confusing and also guaranteed perfect placement of the punch hole. Photo 13 shows how these were hooked together with the ribbon - for an extra visual. Photo 12 ... Again using the larges hole on your Crop-A-Dile punch a hole on the Crushed Curry Cardstock appromately 1/2 way between top and bottom and about 1/2" in. Photo 13 ... 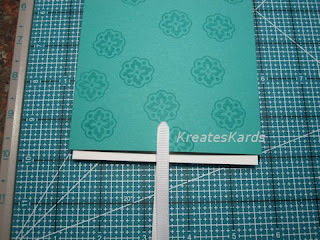 Putting the Whisper White Cardstock inside of the Bermuda Bay card; line up the punch holes. Now feed the Whisper White ribbon from the top of the card thru the insert/sentiment piece, and thru the back of the card. Even the ribbon out so that the ends meet on the right. Ribbon piece for this is 22" long and 1/4" wide. 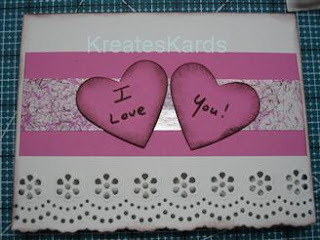 Photo 14 ... Gently slide the "insert" sentiment piece (Whisper White Cardstock) into the card. 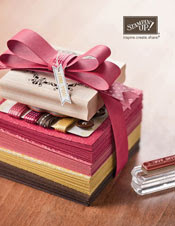 Keep your ribbons even when doing this and leave part of the "insert" out of the card. Tie a knotted bow (see photo below). Again, be sure that a small amount of the white insert is showing. Photo 15 ... Take the 4" piece of ribbon, thread thru the hole of the Crushed Curry Turtle pie and tape the ribbon end to the back. Photo 16 ... Attach 5 Dimensionals to the back of the Crushed Curry Turtle piece. DO NOT put the dimensionals where the ribbon on the card base will be or will hit it. 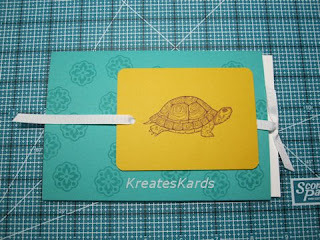 Photo 17 ... Center Crushed Curry Turtle piece over the ribbon on card base. 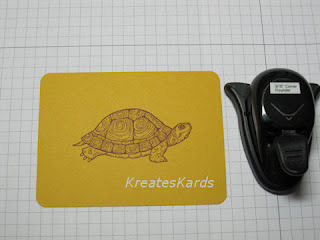 Turtle will be a bit more to the right of the card as shown in photo. 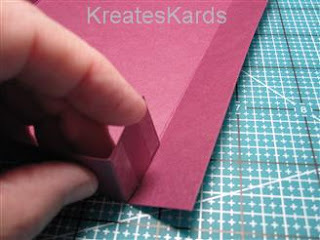 Using a piece of tape, tape the other end of the ribbon (left side) to the inside of the card. You may find this easier to do IF you pull the insert out a bit to the right before taping the left side. Photo 18 ... 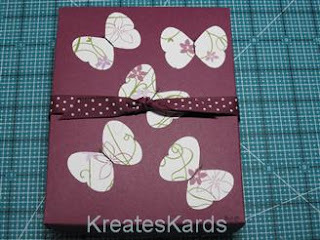 Finished card with insert pulled out. Photo 19 ... photo of Full of Life, item #111500 if anyone is interested in ordering this set. Deal of the Week - Stampin' Up!